If you’re here, you’re probably looking for the best rated steam mops so you won’t waste time or money. You’re probably tired of lugging around a sloshing bucket full of water, not to mention all the wringing and rinsing. You may be concerned about your kids or pets coming into contact with chemical residue from floor cleaners. All of these are great reasons to shop for the best rated steam mops on the market. Steam mops, sometimes called steamer mops, come in a wide variety of styles for every budget. Our 2019 reviews feature products from well-known brands like Shark and O’Cedar. But before you shop, here are some things to consider when looking for the best steam mop for your home. Make sure your floor can handle a steam mop. You should almost never use a steam mop on a wood floor. It leaves behind moisture that can seriously warp and damage the wood. The high steam temps can also damage the finish. Steam mops work best on fully sealed floors like tile and some vinyl. Check with your flooring manufacturer to see if a steam mop is safe to use on your floor type. Your warranty is in danger of being void if you use steam mops on certain manufacturers floors. How big are the rooms you need to mop? If you have large spaces to clean, you’ll want a steam mop with a reservoir that doesn’t have to be refilled every 10 minutes. You’ll also need a mop with a long power cord. Are extra features worth the money? Some steam mops come with on-off buttons while many turn on by plugging in. Some allow you to control the amount of steam. Some come with accessories for cleaning carpet, windows, blinds, and more. Pick those with features you’ll actually use. 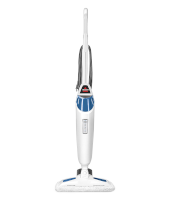 A lightweight steam mop with touch-free technology and intelligent steam control. Worth the price for large floors. A budget-friendly, user-friendly steam mop. Great for cleaning small rooms, tight spaces and corners, and for refreshing carpets. Convenient features tackle tough dirt and make mopping quick and easy. A steam mop great for large floors and won’t break the bank. 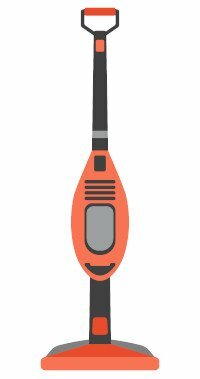 Added accessories like a handheld steamer and hose make this mop great for more than just floors. A real multi-tasker. Accessories galore, this heavyweight steam mop isn’t for the casual cleaner. Cleans both floors and many other above-floor surfaces. A long (22 ft) power cord allows good reach for large areas. 3-level steam control works well for various levels of grime. On/off button, steam level control, and stands on its own. Triangular head swivels to easily reach corners and tight spaces. Removable water tank, stands on its own, 3 steam settings, and a flip-down scrubber. 23 ft. cord and 12 in. mop head great for large floors. Handheld steamer and hose attachments, removable water tank, 3 steam settings, stands up on its own, heats quickly. Touch-free pad release, large water tank (16.9 oz. ), 22 ft. cord, 3 steam settings, steam blaster, several accessories. No removable water tank. No on/off power switch. Doesn’t stand on its own. May leave streaks depending on floor type. No water level indicator, non-detachable tank and doesn’t work well with hard water. Carpet glider only refreshes, doesn’t clean. No dedicated on/off switch, water tank cap may break and/or get stuck, leaks pose risk of burns on bare feet. More expensive than other steam mops, no extra cleaning pads, thin cleaning pad can roll up while using, must refill often. No carpet cleaning attachment, heavy at 16 pounds (w/o water), steam blaster can be awkward to operate, some accessories may be missing. There’s a reason Shark is a hugely popular brand for floors. They have innovative products that are designed to work great while lessening the physical demand floor cleaning requires. Their products are generally lightweight, affordable, and come with features to make your cleaning time quicker and easier. The Shark Genius Steam Pocket Mop is no exception. If there’s such a thing as a “smartmop” this is almost it. While we were impressed with it, we found a few things that could be improved. Touch-free tech means minimal handling of the cleaning pads (comes with 2). There’s a quick release so you can drop the dirty pad straight into the washing machine or hamper without the risk of burning your hands. A 22-foot power cord means you’ve got a lot of mopping room without having to search for a closer outlet. It’s only 6 pounds (not counting water) so your back and shoulders won’t ache from lugging it around. A 3-setting steam control helps clean a variety of flooring and grime levels. There’s no on/off switch. You plug it in to turn it on. That’s a little primeval considering the other smart features. It also doesn’t have a stand alone feature, meaning you’ll have to prop it up somewhere if moving furniture. One of the biggest downsides we found is the non-detachable water tank. They do provide a flask to refill it, but the user manual says to drain all water from the tank before storing. That means turning the whole mop upside down over a sink or tub. The most popular features seem to be the steam blaster spray for removing tough spots, extra cleaning pad, and the adjustable heat controls. Several customers said it left no streaks, while some noticed a lot of streaks. This may be due to their type of flooring or hard water (try distilled for best results). Steam mops are NOT good to use on some flooring materials like wood. The swivel feature was a toss-up: some customers loved it for getting around bed posts and corners but others thought it swiveled too much so was hard to control. O’Cedar is another leading name in the floor cleaning industry. This microfiber steam mop is a simple, budget-friendly offering that provides a lot of bang for the buck. This one’s great for tight spaces with its small profile and triangular shape of the mop head. It even refreshes carpets. If you’ve never bought a steam mop before, this model is a good starter mop. This mop is super lightweight at 5 lbs (not counting water). The triangular shaped mop head does a great job of getting into corners and tight spaces. Two microfiber cleaning pads are included. They glide easily over hard floors. The adjustable steam settings, on/off switch and ability to stand on its own are big pluses, especially for moms who are often interrupted while mopping. The snap-on carpet glider is a nice addition too. The water tank isn’t clear, so you can’t easily tell how much water is inside. It takes two fills from the included cup to fill the tank. And the tank isn’t detachable. Hard water and this mop don’t get along. For best results, you’ll need distilled / demineralized water. The carpet glider, while a good refresher, doesn’t really clean the carpet, so you’ll still need a shampooer for that. The most popular features for customers include the ability to stand on its own, a decently long cord (20 ft), fast heat up (20 seconds) and affordable price. 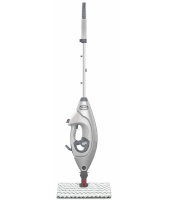 Several of them felt the swivel action and shape was a godsend to clean hard to reach areas. Alternately, customers didn’t like the non-detachable tank, which makes draining the mop a pain. Several people were aggravated that there is no water level indicator, so the mop may run of of water mid-job. 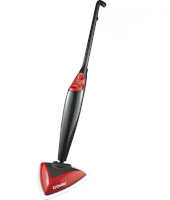 The Bissell PowerFresh is an impressive steam mop that both performs well and doesn’t break the bank. There are a lot of great features to love about this mop, which is why it’s our Heavy Hitter. For convenience, versatility, and cleaning power, the PowerFresh is a serious contender for floors that have a serious amount of grime. It does, however, have a few drawbacks, particularly with quality control. For the price, the PowerFresh has a lot to offer. The removable water tank, for instance, is a huge plus for convenient refilling. It stands up on its own, has three levels of steam control, and comes with Febreeze scent discs. One of the most useful features is the flip-down scrubber brush so cleaning stuck on grime and grout is a lot easier. A 23 ft. power cord and 12 inch-wide mop head are perfect for large floors with heavy traffic. There is no dedicated on/off switch. You plug the mop in to turn it on, but you CAN turn off the steam while the mop is powered on by pressing the steam control button a few times. As far as the steam settings, the higher settings can leave floors quite wet and slippery. There may be some quality control issues involving the water tank cap either breaking and/or getting stuck which can result in leaks. If water leaks from the steam vent, it can cause burns on bare feet. The removable water tank was a huge convenience factor for a lot of customers. They also loved the scrubber brush for getting into grout and removing dried-on sticky messes. By far, the biggest complaint was the water cap that sometimes got stuck in the water tank and/or broke, which led to leaks. The high heat left some burn marks on a customer’s laminate floor, so ALWAYS check with the floor manufacturer before using a steam mop. With a name like Light ‘N’ Easy, you’d expect, well, a light and easy mopping experience, which is what you’ll get with this steam mop. At 6.4 pounds (without water) and an 11.5 oz water tank, it shouldn’t be hard to push. There’s a lot going for this one, but it’s definitely not the cheapest option. If you’re already familiar with more basic steam mops, the Light ‘N’ Easy would be a good upgrade for you. 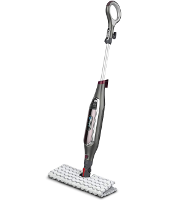 If you’d like to steam clean more than just hard floors, this is the mop for you. 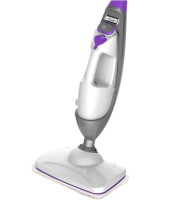 It includes a handheld steamer attachment and a hose for cleaning drapes, blinds, bathrooms, etc. You can even use it as a clothes steamer to remove wrinkles. There are 3 steam settings. The mop is lightweight at 6.4 pounds (w/o water) and heats up quickly. It also stands on its own and has a removable water tank for easy refilling. This is quite a bit more expensive than the other brands listed here, so if you’re on a budget and don’t think you’ll use the extra functions, it might be best to go for a cheaper option. There’s no dedicated on/off switch, but to turn off the steam, you can simply return it to the upright position or unplug it. There’s only one cleaning pad included, so you’ll have to purchase more separately. This is a really popular steam mop among customers, mostly for the attachments that allow for cleaning behind toilets, appliances, blinds, etc. They love the removable water tank and quick heating. Though some customers thought it didn’t last long enough between refills (about 20 minutes). The biggest complaint was the cleaning pad, first because there are no extras provided and secondly because it’s thinner than other pads and can roll up as you’re mopping, which makes it hard to push. Shark’s done it again with a smart mop that cleans more than just floors. Intelligent steam control, a liftaway garment steam and steam blaster technology really pack a punch for serious cleaning. This mop is for those who don’t mind spending more for an appliance. Like many things, you get what you pay for, and this steam mop is no exception IF you need all the attachments. One word: Accessories! In the box, you’ll find a triangular mop head with pad, 3 ft hose, garment steaming tool, double sided cleaning pad, and an above-floor pocket tool with microfiber pad. This model also has a touch free design that lets you release the used mop pad straight into the hamper without the risk of burning your fingers. More steam mops should have this option, in our opinion. The steam blaster is great for targeting those stubborn sticky spots. It’s heavy at 14 lbs and once you add water to the 16.9 ounce water tank, it might get tiresome to handle after a while. The steam blaster is operated by flipping the mop head around and pressing the wand toward the floor, which can be awkward. One of the biggest disadvantages is that it doesn’t stand on its own. For the price, that’s pretty disappointing. There’s also only one pad for each attachment in the box, which means you have to wait while you wash and dry it between cleanings. Customers were pretty impressed with this mop for the most part. Many commented on how well the hose and pocket cleaning tool worked for surfaces like cabinet doors. However, some didn’t like that you have to hold the trigger constantly while in handheld mode. Some customers reported accessories missing from the boxes upon arrival. Others said it didn’t work well for really stuck on spots and felt it was too heavy to flip around for the steam blaster. First of all, there’s nothing wrong with a good old-fashioned mop and bucket. They’re cheaper and if you buy the right regular mop, it can do a great job on any type of floor. We’ve listed several top rated ones on this site. But a steam mop provides a few things a regular mop just can’t do. They require no chemical cleaners whatsoever. All you need is water and a power outlet. For families with babies and pets who are often in contact with the floor, a steam mop will eliminate the residue left behind from cleaning solutions. Some adults and children are also allergic to several components of cleaners so a steam mop reduces those allergens. As far as sanitizing, most steam mops claim to kill 99% of all germs, which may or may not be accurate. The hot steam (up to 212 F or higher) produced by steam mops can definitely kill germs, providing you’re using clean water and a clean pad. The pads are machine washable, so you’re also saving money in the long run by not having to buy cleaners and disposable pads. Steam can also loosen up sticky things like jam that have dried on the floor so you can mop it up easier. Nobody likes to resort to scratching icky stuff off with their fingernails. With quick pad release options, you may not have to touch the dirty stuff at all. This really depends on your floors. For most hardwood floors, steam mops are a no-no. They can leave behind a lot of moisture, and the steam pressure can push it into the cracks between the wood. This can lead to the wood buckling and warping. Steam can also strip off polish and other coatings, leading to damage and dull floors. Laminate and vinyl floors aren’t always impervious to steam either. Steam can loosen the adhesive on engineered and laminate wood flooring, causing the material to swell and buckle. Even vinyl could potentially be damaged by hot steam, causing discoloration and damage to the outer layers. If you have glazed tile, sealed granite or other stone floors, these are usually the best match for a steam mop. On these floors, they can actually do a better job than a regular mop by penetrating the grout and natural surface irregularities. 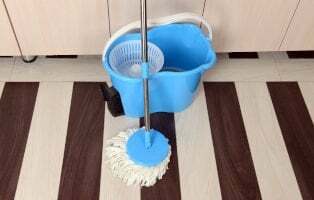 Some wood, laminate and vinyl can hold up to a steam mop. But before you get one, check with your manufacturer to see if that’s the case. Using a steam mop can can actually void the warranty on some floors. You should avoid that if at all possible. This can be a big challenge to decide because there are so many on the market. The limiting factors are budget, ease of use, accessories, and functions. 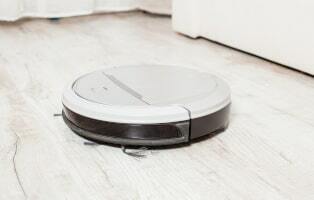 If you’re willing to pay more, you’ll likely get a multi-functioning steam mop that can also steam clothes and clean above-the-floor surfaces like cabinets, appliances, toilets, blinds, etc. The more budget-friendly options can work just as well, but usually will only clean floors. Steam control – Basic steam mops have one steam setting. You plug it in, it heats up, and then it’s ready to go. But on some floors, you may want more or less steam depending on grime level. So mops with a few steam levels are handy for that. On-off switch – Basic steam mops turn on by plugging in and turn off by unplugging. An on-off switch is handy if you need to turn it off quickly without having to go all the way to the outlet to unplug. Ability to stand on its own – As simple as this sounds, it’s a very handy feature. Steam mops are top heavy, so if you need to move furniture out of the way and have to prop the mop up on a wall, it can easily fall down. The stand-up feature eliminates that aggravation. Detachable water tank – This makes filling and emptying SO much easier than those that don’t detach. There’s no keeping up with a refilling cup and no having to turn the mop upside down to drain it when you can remove the water tank. Extra cleaning pads – Steam mops that come with extra cleaning pads save you time in that you can always have a clean pad handy while you’re dirtying up another one. Some steam mops come with only one pad, so you’ll have to buy extras separately. Power cord length – The bigger your mopping area, the longer your cord should be unless you don’t mind pausing to hunt down an outlet mid-mop. Water tank capacity and water level indicator – Again, the bigger your space, the more capacity you’ll want in the tank or you’ll have to refill a few times while mopping. Also, a clear water tank that allows you to see the water level is really handy, especially in models that don’t have a removable tank. Touchless tech – Steam mops with a hands-free cleaning pad release eliminate the risk of burning your hands when removing a dirty pad. Avoid tap water – Use distilled or demineralized water instead, especially if you have hard water. Tap water can leave streaks on the floor and the minerals in it can clog up your steam mop. If you must use tap water, descale your mop regularly with vinegar. Mind the heat – Steam mops can heat water to 200 degrees F or more. Once you turn off the mop, it can take a good 5 minutes for it to cool down enough to remove the pad (unless it has a touchless release). Also, don’t leave it sitting for any length of time on your floor, or your floor could get damaged. Always sweep first – We can’t say this enough. 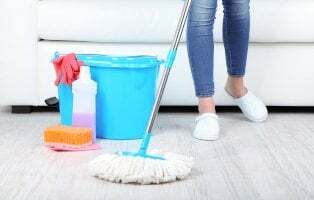 Remove all loose dirt, hair and debris as thoroughly as you can with a broom or vacuum before you mop, or you’ll just push it around and scratch the floor. Change pads regularly – Using an overly-dirty pad is just as bad as not sweeping first. Once the pad’s saturated with dirt and water, it will stop picking it up and you’ll just push the grime around, including any germs that go along with it.